As you know, we at GeekTown are huge comic book fans, so when DC’s publicity people offered to send me an early release of their DC Comics 75th Anniversary Poster Book for review I jumped at it! The book is around A3 in size, and contains 100 ‘ready to frame’ posters of DC Comic covers throughout the years – From the front cover of ‘New Fun’ in 1935, through to one Alex Ross’s stunning cover’s for 2008’s ‘Batman R.I.P.’ run. Each cover comes with a commentary on the artwork by Robert Schnakenberg , explaining the background of how it came about, and why it’s included in the book as an important DC issue. Every page edge is perforated, so (if your so inclined) you can easily remove the pages and hang them on your wall. Personally, i rather like them in book form though. If your a fan of DC Comics, the DC Comics 75th Anniversary Poster Book really is a ‘must have’ addition to your collection. 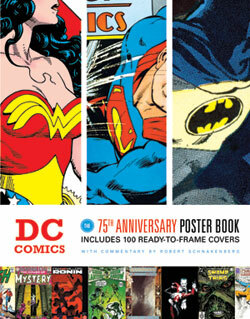 DC Comics 75th Anniversary Poster Book is due on sale in the UK in October 2010, for £24.99 RRP. ← Inception World Premiere In London!